Dumb bit out of the way with – There is no story for this, as it’s a simulator. Okay, now that I’ve addressed the fact there’s no story, onwards with the rest of the review! 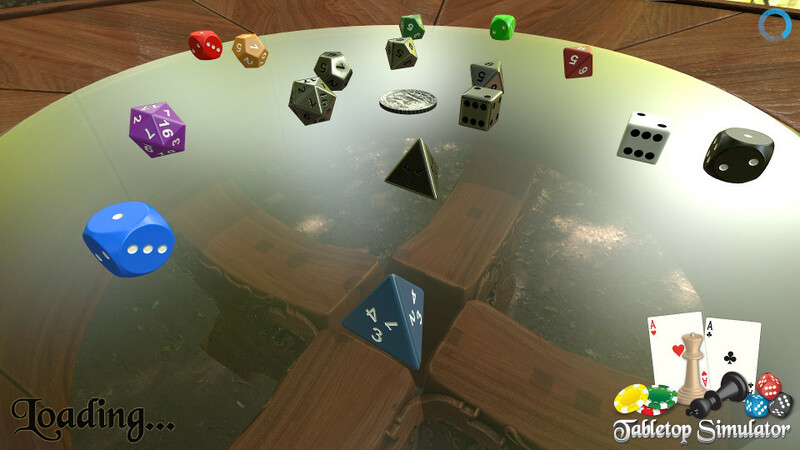 Tabletop Simulator is pretty unique; when it first came out, I bet a lot of people who picked it up just liked to mess around with the physics engine built into the game. You can pick up and place pieces in a relatively easy to believe manner. You can throw, flick, flip prod and turn pieces, as well as a million different other things, I’m sure. You are given tools, such as the ability to draw on the maps. You can overwrite some elements that allow you to do so – All in all, there are a lot of elements that can be interacted with in ways you’d like. Let’s address the elephant in the room, the table flip mechanic. You’d think that you’d run into a lot of people doing this, but in all honesty, unless you’re in singleplayer mode, or if you allow people in your game to do so, it’s really not a common problem (thankfully). One thing I find odd, but endearing, is the fact it actually gives you an achievement if you flip 100 tables, but honestly, even I would find flipping that many tables to be tedious. You can go in and out of different game rooms, including open online rooms. 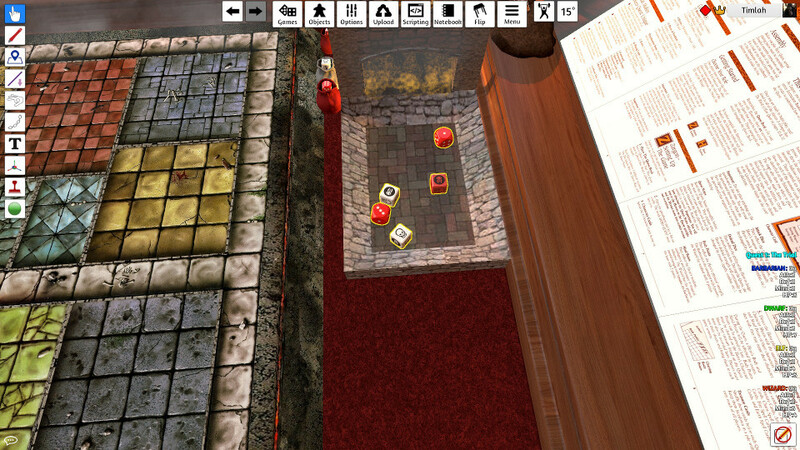 You can also create private rooms. You only need to download some of their DLC games, or a game from the Steam Workshop. The base game itself comes with a few titles, such as Chess. 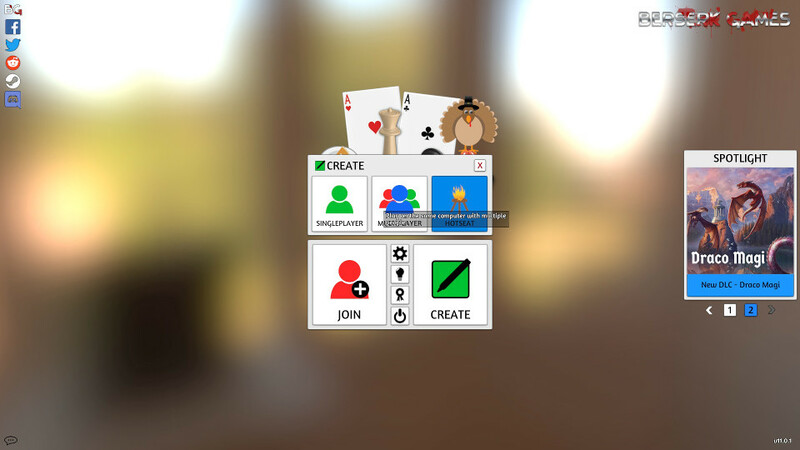 You can download a Monopoly board as seen in the above table flip gif, should you want to do that to yourself and your friends. 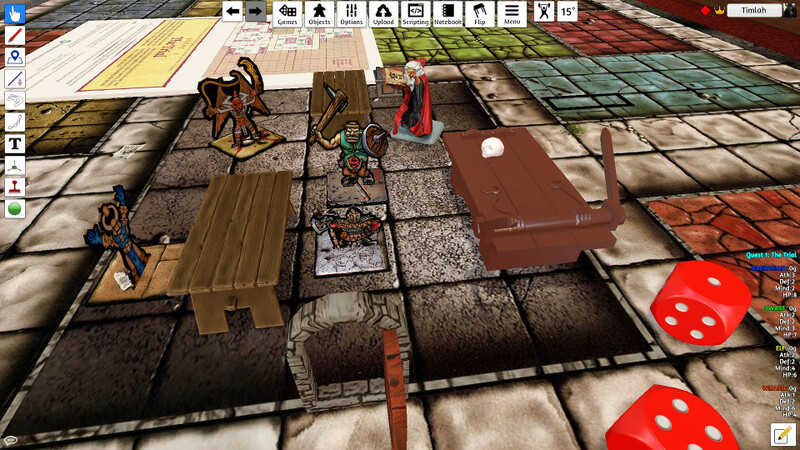 Once you master how to pick the pieces up and place them, which I will admit, takes a bit of getting used to, you’ll be well on your way to playing tabletop games at your PC. It’s an inexpensive way to play a game you’d otherwise have little to no access to. Finally, I’d like to briefly talk about the game in the screenshots in this article. All of them (except the screenshots of the title screen itself) are taken in single player mode, using the exceptionally well made “HeroQuest: Master Edition (All Expansions)“. 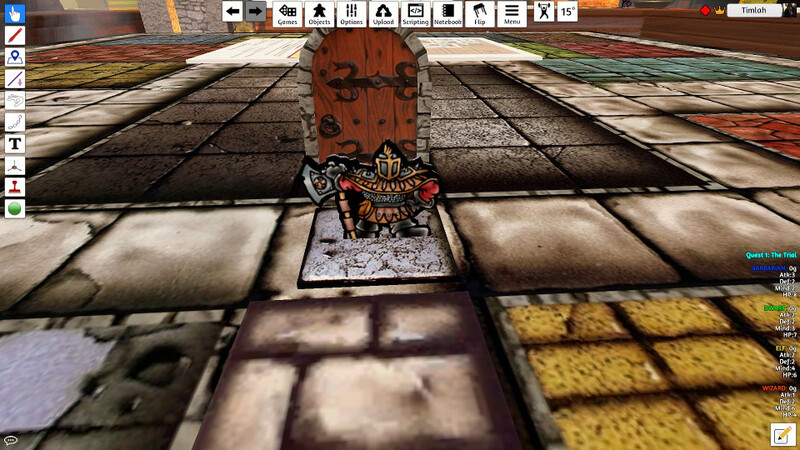 At some point, I’d love to get some people together to play HeroQuest with on Tabletop Simulator, so if you’re interested then let me know. 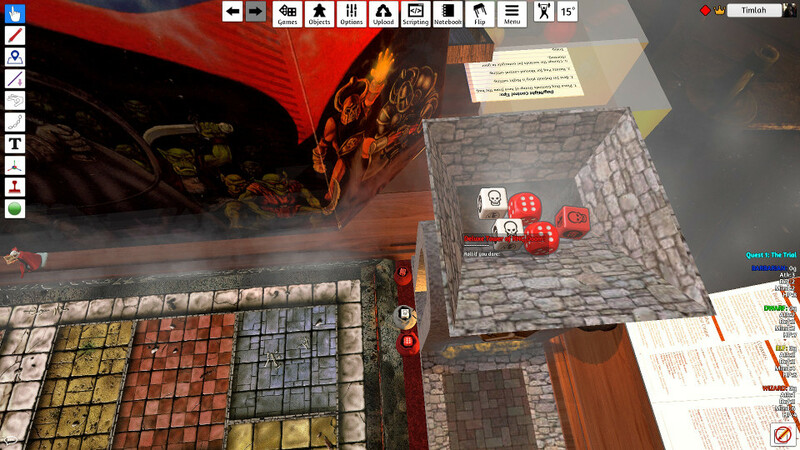 It’s an excellent game and this is the most faithful recreation of a board game that I’ve ever seen. 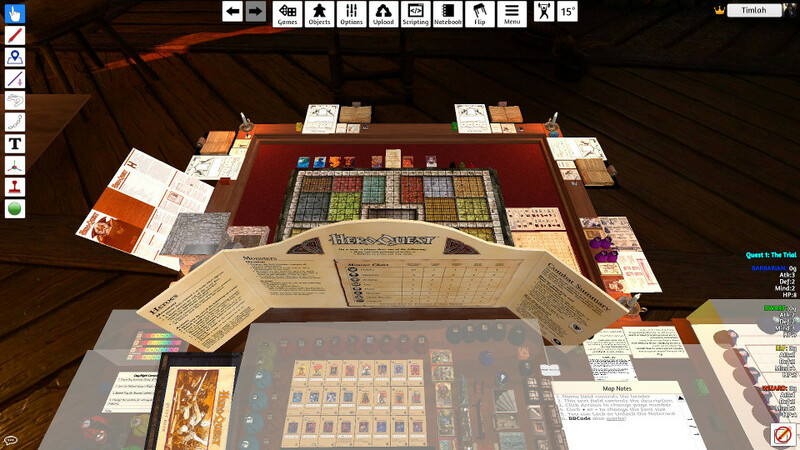 Whilst listening to it over and over could get repetitive, the audio of Tabletop Simulator is fantastic. The opening music is quirky and happy, whilst the in-game music is all royalty-free music which is apparently locatable in the YouTube Audio Library. I’m all for the use of royalty-free music, especially if it gets the job done! You can’t add your own music into the game officially, but you can download this neat little community made mod, which adds an MP3 player to the room. This allows you to play whatever music you want, so not a bad little implementation! Don’t get me wrong, I’ve spoken quite a bit about the community mods. 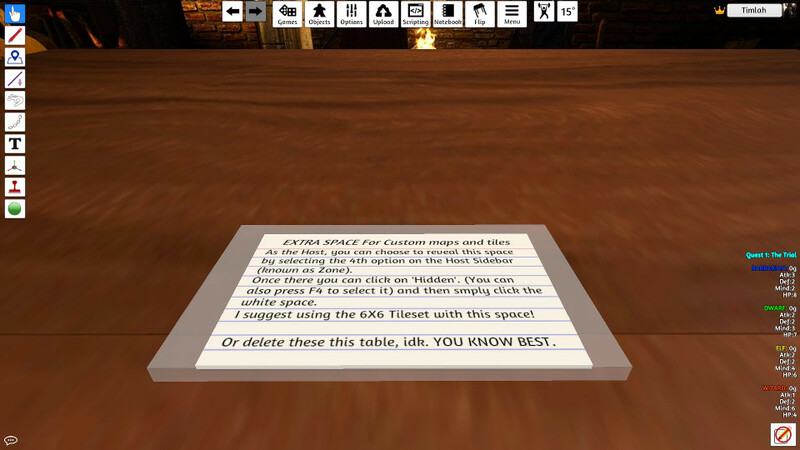 Indeed, it’s fair to point out that Tabletop Simulator wouldn’t be what it is without these mods. However, in a nutshell, the game itself is genuinely well put together. It’s a treat – And originally, when it first came out, the support was there, but there wasn’t an abundance of titles to download from the marketplace. Jump forward a number of years and you’ve gotten yourself a genuinely excellent title. If you’re a tabletop gamer and are looking for a way to share your passion for board games with others, or if you’re trying to make a game for yourself, trust me – This is a must have game. 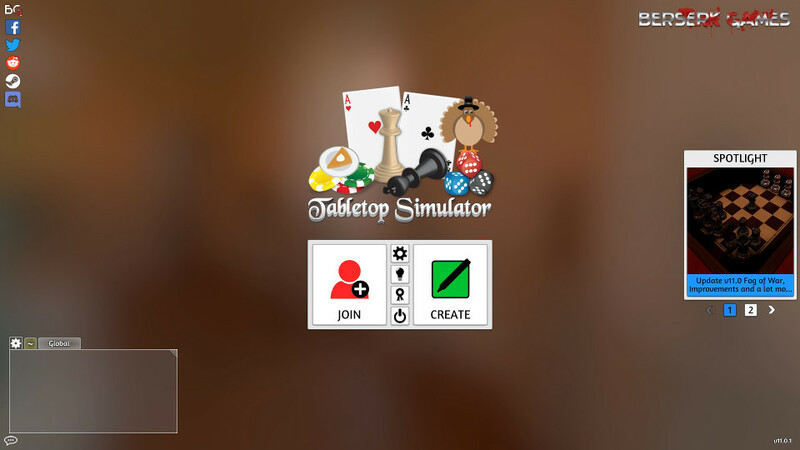 Have you ever played Tabletop Simulator? Have you flipped 100 tables yet? Leave your thoughts of the game in the comments below, or over on Facebook and Twitter. This entry was posted on November 30, 2018 by Timlah. 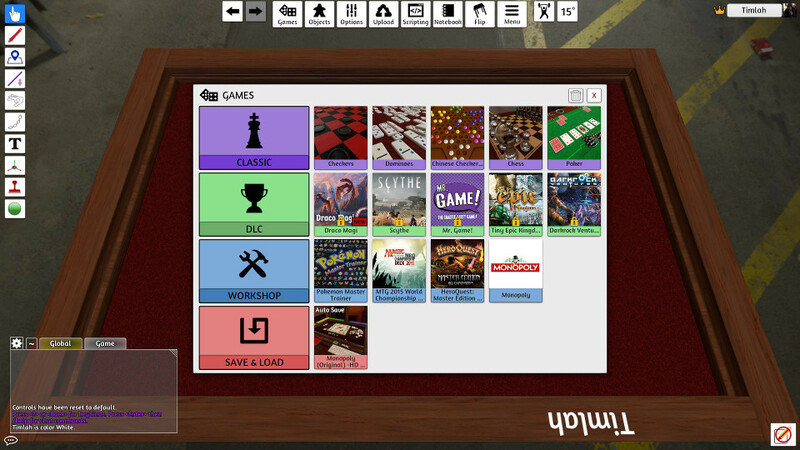 It was filed under Gaming posts, Reviews, Video Games and was tagged with Board game, board games in video games, Gameplay, Review, Tabletop Simulator, video game.